part of my Little Bigfoot series, there are more animals available in the series but the ones pictured all come with video tutorials. This week I am featuring my patterns (ones that are part of sets) that come with videos to better help the beginner. Most of my videos found on my youtube channel will guide you stitch by stitch and follow along row by row of the written pattern so even the newest beginner can get an amigurumi made. For those advanced beginners, if there is a Little Bigfoot in the series that you want to make and it does not have a video you can still use one of the videos to help you make the head, body and limbs since they are are the same as each other and the differences will be yarn color, muzzles and ears or the longer neck as found in the Little Bigfoot Giraffe. I hope to one day have a video for each animal available but in the mean time I hope the videos that are available help. Find all the Little Bigfoot Animal patterns right here and yes ~> the patterns are all free! Fun fact: My Little Bigfoot Monkey is one of the highest viewed videos on my channel with 91,104 views to date and counting! Oh my! How adorable.....I cannot wait to get started. These will make wonderful Christmas presents. Thank you for making the patterns free! so happy to read your message! I'm glad you like the patterns and will use them for Christmas ~ Have fun!! I love all your little bigfoots. 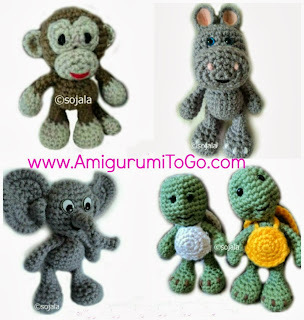 I have made all of them and I think the monkey is my favorite!! I have also made Darcy as the 2 foots one and one that was just a tad smaller. You rock!!! Do u have a you tube video for your giraffe? I can't view the pattern when I click on the picture.